Gloss Meter Introduction | How is Gloss Measured? What difference in gloss can a human see? 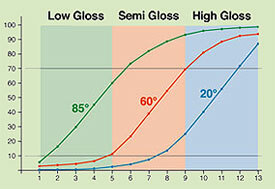 4) How is Gloss Measured? Gloss is measured using a Gloss Meter also known as a Glossmeter) which directs a light at a specific angle to the test surface and simultaneously measures the amount of reflection. The type of surface to be measured determines the gloss meter angle to be used and thus the gloss meter model. Metals have a much higher reflection and are less angle dependent than non metals. The measurement results of a glossmeter are related to the amount of reflected light from a black glass standard with a defined refractive index, and not to the amount of incident light. The measurement value for this defined standard is equal to 100 gloss units. Materials with a higher refractive index can have a measurement value above 100 gloss units (GU), e.g. films. 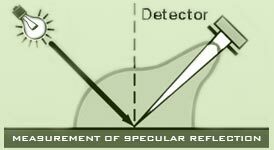 In case of transparent materials the measurement value can be increased due to multiple reflections in the bulk of the material. Due to the high reflection capabilities of metals values of up to 2000 GU can be reached. For these applications it is common to document the measurement results in % reflection of the illuminated light. Glossmeters and their handling procedures had to be internationally specified to allow comparison of measurement values. 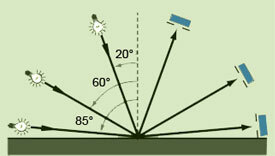 The angle of illumination is of high influence. In order to obtain a clear differentiation over the complete measurement range from high gloss to matte, 3 different geometries, i.e. 3 different ranges, were defined using a 60° glossmeter. In this case study, 13 samples were visually ranked from matte to high gloss and measured with the 3 specified geometries. In the steep slopes of the curves the differences between the samples can be clearly measured, while in the flat part the measurement geometry no longer correlates with the visual. Gloss measurement for any application, whether you are dealing with specific applications or need a universal solution for high to matte gloss samples, www.gloss-meters.com offers a complete line of glossmeters.